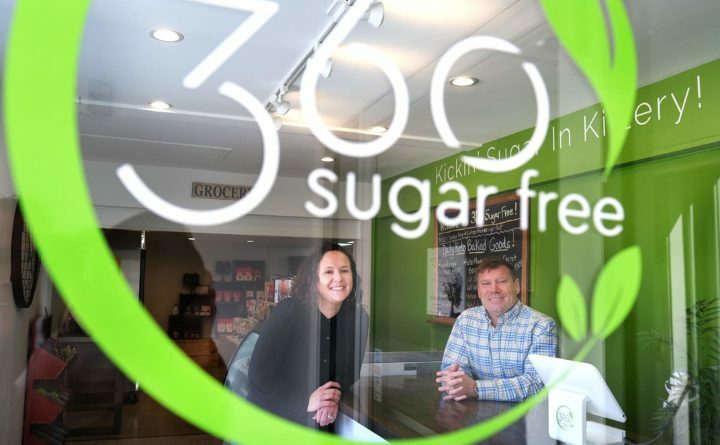 Christy and Chris Varney have opened 360 Sugar Free in Kittery, a store that's part bakery and part grocer, selling sugar-free, low-carb foods. KITTERY, Maine — Christy and Chris Varney have been blown away that the opening of their retail store, reflecting their own personal kitchen habits, has drawn customers from Boston to Bangor. 360 Sugar Free opened in February at 165 State Road, offering baked goods and grocery items for sugar-free, low-carb, gluten-free, keto, dairy-free and paleo lifestyles. The appeal has gone beyond what the Varneys expected, with customers spanning from Weight Watchers clients to health nuts, to those with diabetes and particular dietary restrictions. The store is 60 percent grocery, 40 percent bakery. The couple uses a keto baker, and they believe there’s no other place in the area that does so. The baked goods have been the most exciting aspect for customers, they said, because many people on keto or sugar-free diets deprive themselves of sweets because the products they need aren’t readily available. 360 Sugar Free has keto lemon bars, keto carrot cake and keto thin mints, for example. No artificial sweeteners are used, with plant-based Stevia being a main ingredient. “We’re proud to say everything here is really good,” Christy said. They sell “two net carb” bagels, keto ice cream, granola, chocolate bars, zero carb rolls, sugar-free pancake and waffle mixes, and baking ingredients. Christy said she and her husband have been eating “keto” for a little over a year, a diet that promotes low-carb intake, moderate protein and high fat. The idea is the body turns fat into ketones for use as energy. They also found when ordering food products on Amazon, it typically required they be bought in bulk. “I was at a career transition myself and we were looking to do something,” Christy said. The couple lives in Kittery with their children, and they both grew up in town, too. Cutting sugar, she said, “translates to so many different ways of eating.” Ultimately, Christy and Chris found people needed a “hub” for “sugar-free, low-carb food. One-stop shopping.” Studies show excessive sugar intake is a serious health risk, and those who cut sugar out of their diets typically see major shifts in their energy levels. “Prior to opening, we honestly thought, ‘This is a great idea, but does anyone else think so?’” Christy said. “The general consensus is that they’re so grateful that something like this exists, for the same reasons we talked about before,” she said. Chris said their clientele spans demographics they never expected to enter the store. “Really fit, health-conscious keto-ers, older folks with diabetics, and children with parents who believe in not giving their kids sugar at all,” Christy added. Chris said they were surprised by how many customers have come in for medical purposes. 360 Sugar Free is open Tuesday through Saturday, 11 a.m. to 5:30 p.m., and hopes to soon open on Sundays, as well.